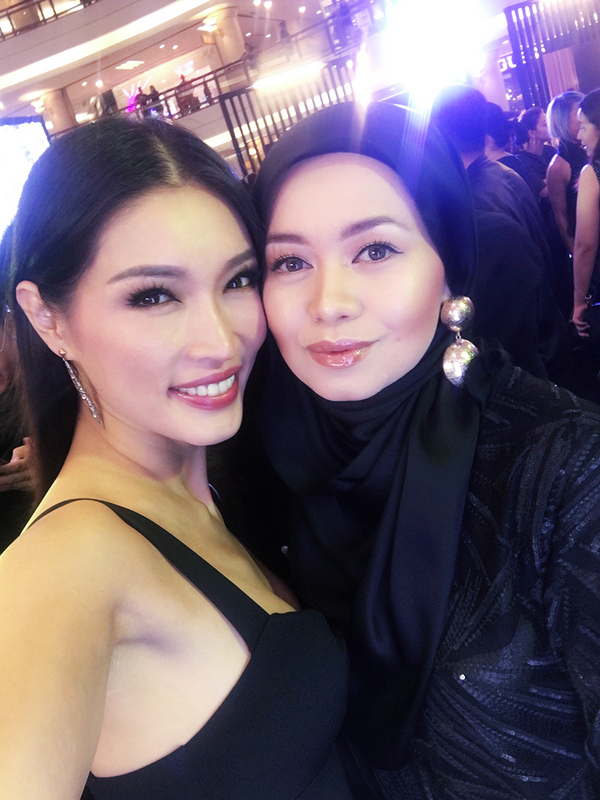 A fortnight ago, I was invited to attend the launch of the Encre De Peau foundation at YSL Beaute's new boutique at One Utama, their second store in Malaysia. There were so many people! As soon as I registered they told me that I would be getting the newly launched Encre De Peau All Hours Foundation as a gift. I actually already have recently gotten one of it in colour B20, so I decided to take code B10 for my gift so that I can mix it around. I came alone that day, but I was glad to meet familiar faces as well as friends in the fashion and beauty scene. I first met Amber Chia who has been supporting aere at almost all aere's shows. Then I met Att Yusof, Nisha Ezzati, Khainina Khalil, Sazzy Falak, Yasmin Hani, Dynas Mokhtar, Atilia Haron and many more. The setting was cool with lights everywhere and so many nice spots to take photos. One of the spots that attracted me the most was the gold swing. If it wasn't for the many other people queuing to take photos there I would have stayed there forever. Its so nice! YSL really knows how to throw an insta-worthy (in my case blog-worthy) launching event! The theme was black chic so I decided to put on an all black outfit from head to toe with just subtle hints of gold. I wore aere's MARLEA sequins top paired with aere's polkadot textured pants from the CHANGE collection to suit the theme. Having worked with the hardworking YSL Team for their Stail.My x YSL beauty campaign, I also bumped into them again here at the event. Thank you for inviting me Carole Sai! Thanks for having me and congratulations YSL team.